The London Commune is organising a reading group on class struggle and the left in Italy. The country has a rich tradition of radical thought and mass movements, from which we can learn a great amount for today. The first of the meetings is on the upsurge of 1919-20, and will take place on 2nd May. All of the discussions are on Monday nights, from 7pm, at Freedom Bookshop, Angel Alley, near Aldgate East tube. All welcome – contact uncaptiveminds@gmail.com for more info. The recommended reading will be posted online in good time for each meeting. See below for the timetable. 2nd May: The Biennio Rosso 1919-20: From mass strike to soviet power? In the first session we will be discussing the Biennio Rosso/’Two red years’ which shook Italy in the aftermath of World War I. Mass strikes led to factory occupations and the self-management of workplaces, but the crisis also posed the question of which class would hold power. This took place as part of a Europe-wide revolutionary movement, and like elsewhere Italy saw creative debates as to the role of trade unions, political parties and workers’ councils and how a post-revolutionary society should be organised. We have prepared this reading pack, featuring two articles on the history of the workers’ movements of 1919-20 and three others discussing the possibility and purpose of soviets (workers’ councils) as an instrument of workers’ power in Italy. In 1922 the fascist Benito Mussolini was appointed prime minister of Italy, his Fascist ‘black shirts’ used by the ruling class to crush the working class which had so threatened capitalism in the Biennio Rosso. It took over three years for the Fascists to establish a fully totalitarian state, but the Communists were divided on how to resist them. While those like Antonio Gramsci argued for the defence of parliamentary institutions by ‘democratic’ parties, the Communists in the lead, the left of the party insisted on the need to fight Fascism by revolutionary means, eschewing defence of the existing state. The Communist Party was banned in 1926 but debates on how best to fight the Mussolini régime continued amongst activists forced into prison and exile. The reading material will feature articles by Antonio Gramsci and Amadeo Bordiga, a piece on the anti-fascist Arditi del Popolo, and also Pietro Tresso’s essay on the Stalinists’ attempts to cosy up to the Fascists in the 1930s. To be posted shortly. As the Fascist order crumbled in the fire of World War II, class struggle was back on the agenda. Although impoverished by the war, the working class became increasingly assertive as it became clear that it was possible to strike against the government and win. The pitch of struggle was akin to that following the end of the 1915-18 war effort. When Mussolini was removed from power in a July 1943 palace coup, millions asked themselves what post-Fascist Italy would be like. Following Stalin’s line, the Communist Party sought to limit workers’ struggles and the partisan movement to a cross-party ‘anti-fascist’ front, preserving the capitalist state even after the collapse of the Fascist régime. This was however hotly contested both within the left and by the many hundreds of thousands of workers drawn into struggle who wanted a new socialist system. The reading will include Arturo Peregalli’s article on left-wing opposition to the Communist Party in this period, as well as pieces on the strike movements in Turin and the history of the partisan movements of 1943-45. 13th June Workplace struggles from 1963 to 1979. The Italian post-war “miracle” was based on low wages and speed-ups. In the years from ’63 to ’79 the factories and streets were the scenes of ferocious battles and day to day stubborn class conflict as the working class fought its alienation and the subordination of their lives to the assembly line. Sergio Bologna’s classic text analyses the development the internal composition of the working-class movements of the 1960s and 1970s. He tracks the history of the post-war Italian party system and the ‘official’ Communist Party, analysing the state’s changing means of combating and containing working-class struggle. Moreover, he situates this discussion in a study of different strata of the working class, the varying political forms by which they expressed themselves, and how waves of struggle corresponded to economic crisis. The reading material is available at Libcom. 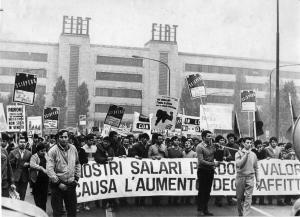 Lotta Continua (1969-1977) was one of the most interesting and innovative groups in the autonomist movement. With their main support young workers in the large northern factories, they also, more than other groups, were active in the south, in community struggles, housing, setting up social centres and so on. Their dissolution in 1977 gives a fascinating insight into the contradictions in the movement at that time. 25th July: Feminism, the social factory and community struggles. The seventies saw class and community struggles break out all over Europe but Italy was especially interesting as the struggles were very radical, really questioning and threatening the capitalist system, and at the same time very widespread, reaching out into many areas of life; housing, the streets, prisons, schools and universities as well as the workplace. Resistance to the eviction of squatting families called factory workers on to the streets, the universities were used for strike meetings, kids walked out of classrooms as different struggles against the same system linked up and overflowed the boundaries between them. The women’s movement, up against the church and the Communist Party, rejected the narrow and alienated terrain of accepted politics and made all sorts of areas of life part of the political struggle. The challenge of the women’s movement was part of the crisis which hit groups like Lotta Continua in the late seventies. Next Next post: time to build a new rank and file?